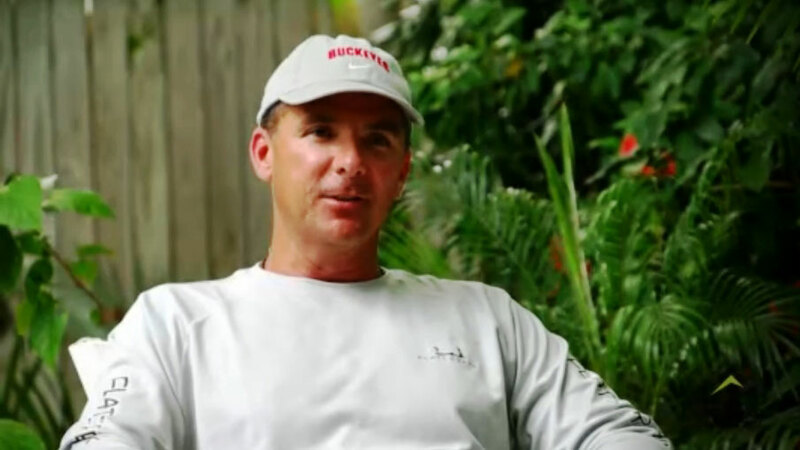 (Jan. 22, 2014) - Ohio State's Urban Meyer ventures to the flats of the Abacos Islands in the Bahamas in a bonefishing adventure with son Nate that includes a rare, 1-on-1 sitdown interview on Gridiron Outdoors with Mike Pawlawski next week on Outdoor Channel. The show airs Friday, Jan. 31 at 10:30 pm, Saturday, Feb. 1 at both 7:30 am and 8 pm, and Monday, Feb. 3 at 10:30 am, all times EST. Meyer, who owns two national titles while at Florida and nearly led the Buckeyes into the title game this past season, spends his 49th birthday away from cell phones, email and football in pursuit of the so-called "ghost of the flats." With coaching from professional outdoorsman and major college/pro quarterback Pawlawski and local guide Maitland "Bonefish Dundee" Lowe, failure is not an option, although Meyer's 14-year-old son, Nate, goes to the final gun before tasting victory. Meyer is ever-so-candid in a sitdown interview with Pawlawski about the Three F's (fishing, football and family) and the parallels between them, about what he looks for in recruits and why his approach is so successful, and about preparing the plan and the players, and then letting the two come together. Catch Meyer's adventure on the Outdoor Channel next weekend. And check us out on social media: Gridiron Outdoors with Mike Pawlawski (Facebook) and @pawlawski (Twitter).